As the interest in polymers/excipients and the formulation technologies continue to rise, so does the interest in new and innovative excipients/solubilizers for achieving the desired solubility and bioavailability. Thus, the industry is taking aim at finding excipients with excellent solubilizing properties. “Excipients with amphiphilic characteristics with appropriate lipophilicity and hydrophilicity will enable the encapsulation of drugs in polymeric matrices or micellar structures to efficiently deliver the molecules with enhanced efficacy while reducing adverse effects,” says Shaukat Ali, PhD, Technical Support Manager, North America, BASF Pharma Solutions. This annual Drug Development & Delivery report highlights the technologies various excipient manufacturers are using to develop more innovative and effective ingredients to improve the performance of drug molecules. 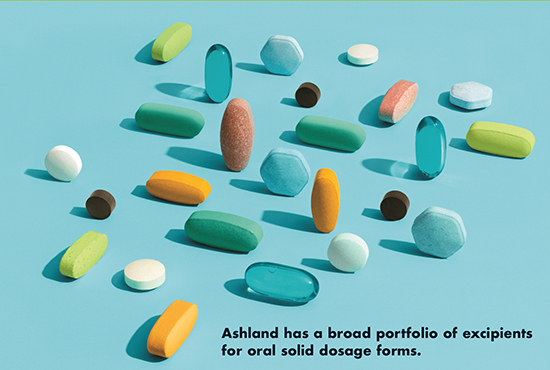 Ashland is a global leader in excipients for advanced formulation of oral solid dosage forms. Typically, its excipients have been used infrequently for formulation of biologicals, but the company does supply purified (endotoxin controlled) products for niche applications and development purposes, e.g., cyclodextrins for protein stabilization, vinyl pyrrolidones for cell culture yield improvement, and sodium carboxymethylcellulose for stability of injectable formulations. However, in response to significant demands for enabling excipients for biologics, Ashland has started to explore technical development, external technology acquisition, and mergers and acquisitions. The pharma industry is at a crossroads in the development of novel and sophisticated excipients that address solubility and bioavailability issues. Demand for such excipients continues to be high because new chemical entities are poorly soluble and less bioavailable. Other challenges include taste-masking of bitter drugs and the regulatory constraints of using novel excipients to overcome this − especially in development of pediatric formulations. As the number of molecules with challenging properties continue to rise, so are the demands for novel excipients to address unmet needs. As the interests in novel excipients continue to rise in the industry, excipient manufacturers and pharmaceutical firms are working more closely to find the solutions that mitigate any regulatory challenges stemming either from the first-time use of an excipient in a drug. It is of more relevance in biologics as excipients are used as processing aids upstream in cell cultures for API production. Thus, highly pure excipients with minimal impurities and known safety profiles have been preferred in biologics. Impurities, if not controlled, can lead to lower yield of APIs in the upstream process. BASF’s Kolliphor® P188 BIO is an example of a highly purified poloxamer 188, which has been manufactured under a controlled process to minimize the impurities for improved API yield in the upstream manufacturing process. Most of the excipients in BASF’s portfolio are multi-functional, meaning that one excipient brings different functional characteristics depending on the application. For instance, Kollidon VA64, a dry binder and a film former for coating and acts as a good solubilizer in melt extrusion. “Kollidon VA64 and/or Kollidon VA64 Fine offer unique benefits to crystalline, poorly compressible or soluble APIs,” says Dr. Ali. Kollicoat® IR, a graft copolymer comprised of polyethylene glycol and polyvinyl alcohol), is highly flexible without any plasticizer for instant-release coating, but is also used as a peroxide-free binder for APIs highly sensitive to peroxide degradation. Kollicoat Protect, on the other hand, which is a co-processed excipient comprised of Kollicoat IR and polyvinyl alcohol, is a multi-functional excipient, used as a moisture barrier coating and directly compressible binder for development of floating or gastroretentive tablets due to its inherent porosity, low bulk density, good flowability, and high compressibility. Other examples include, Kollidon SR, which is a co-processed excipient used for controlled-release matrix tablets, while other directly compressible excipients such as lactose-based Ludipress® and mannitoL-based Ludiflash® have been used as a dry binder and orally disintegrating tablets, respectively. Excipients are no longer used just to bulk up a formulation or mask taste. Functional excipients are of great interest, and where excipients were once restricted to materials with inert properties, pharmaceutical companies and their development partners are now more frequently seeking excipients that add value by improving a product’s profile. Excipients are, therefore, often critical to overcoming the physicochemical and biological barriers to achieving optimal drug exposure. Improving solubility is the most common purpose for functional excipients. Lipid-based drug delivery systems are complex formulations consisting of mixtures of excipients that deliver insoluble drugs to the gastrointestinal tract in a solubilized form. Polymers used in hot-melt extrusion and spray dried dispersions keep drug molecules in an amorphous state, retard crystallization, and thus, enhance solubility. “In addition to enhancing solubility, sophisticated or functional excipients can be used to help modulate release of drugs, improve processing and manufacturing, and improve stability,” says Dr. Benoit Hilbold, Product Development Supervisor, Catalent. “Catalent has employed excipients to help in the opening of tight junctions for oral delivery of macromolecules. 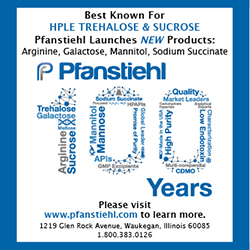 Catalent has investigated the use of more pure excipients to capitalize on certain properties.” An excipient can be “purer” in several different ways: elimination of degradants, altering molecular ratios in heterogenous excipients to exploit certain characteristics, and altering peroxide values. For example, Catalent has formulated softgel products that have oxygen permeability, providing greater stability for certain APIs or nutritional supplements such as cod liver oil. An increasing percentage of the pharmaceutical pipeline is composed of biologic molecules. To reach their full commercial and therapeutic potential, these biologic molecules need to be properly formulated into drug products. 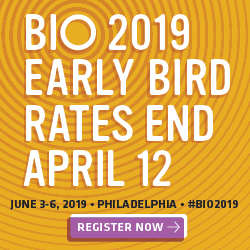 “The use of excipients to increase biologic manufacturing yields and production efficiencies holds tremendous business potential in terms of reducing production costs,” says Dr. Ronak Savla, Scientific Affairs Manager, Catalent. Novel excipients can reduce the time and cost associated with manufacture, not only so that patients receive the best medicines possible, but also to help companies ensure they are able to provide a reliable supply to patients. In addition to preventing instability and aggregation during processing or storage, excipients are being sought to manufacture high concentration protein formulations. Nearly half of biologic molecules in the pipeline require a dose of 100 mg or more. Such doses can’t be administered using subcutaneous injections, which is preferred for outpatient treatment with biologic drugs. “Novel excipients that enable highly concentrated biologic drugs have the potential to create more patient-friendly drug products,” says Dr. Savla. Formulators can realize versatile formulation and drug delivery options by leveraging the broad potential of functional polymer excipients. Evonik’s portfolio of oral dosage functional polymers (EUDRAGIT®) for the past six decades, and bioresorbable polymers for parenteral drugs (RESOMER®) for the past four decades, are advanced excipients for targeted or modified drug delivery, says Dr. Firouz Asgarzadeh, Director Formulation and Application Services, Evonik Health Care. Specific drug release characteristics can also be achieved by combining different excipients, such as a time-controlled permeable yet insoluble polymer with inorganic or organic salts. Advancements in co-processed excipients can bring unique advantages to the excipients market. Evonik added co-processed excipients to its polymer portfolio, such as EUDRAGIT E PO ReadyMix for fully formulated taste masking and moisture protection with custom color-matching services, and PlasACRYL® an easy-to-use excipient suspension containing plasticizer and glidant. “These excipients provide significant time and cost savings in production plus the added benefit of higher formulation safety,” says Dr. Asgarzadeh. Evonik has also developed alcohol-resistant coatings for multi-particulates using EUDRAGIT polymers combined with sodium alginate. “These formulation solutions are popular because there are no regulatory hurdles to overcome as with new excipients,” says Dr. Asgarzadeh. “In our experience, most pharmaceutical companies prefer these easier approaches because they reduce development efforts and time to market.” Developing new excipients with specific properties will be considered for drugs with a high market potential and if none of the commercially available excipient solutions yields the desired results. In some cases, intellectual property can play a role in new excipient design decisions. This is especially true for parenteral depot formulations. 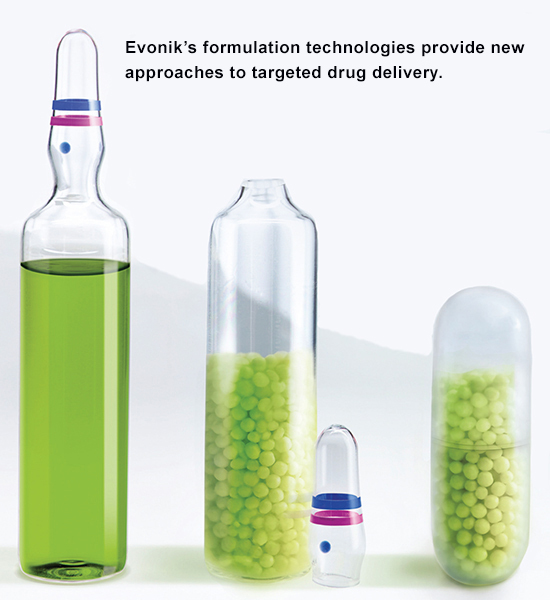 To this end, Evonik launched RESOMER® Select bioresorbable polymers. “Overall, our aim is to ensure that newly developed drug delivery excipients are compendial according to the major pharmacopeias,” says Dr. Asgarzadeh. As an example, in 2017, Evonik launched EUDRAGIT FS 100 powder, which allows pharmaceutical companies to use this well-known polymer in new applications like hot-melt extrusion, solvent spray drying, and solvent coatings. Given the enormous costs of developing raw materials, need to characterize safety profiles, and the tortuous regulatory pathway one travels for their approval, developing novel excipients is not a straightforward option. Instead of embracing the new or the unknown, the pharmaceutical industry can also rely on innovation with existing and well-characterized materials. 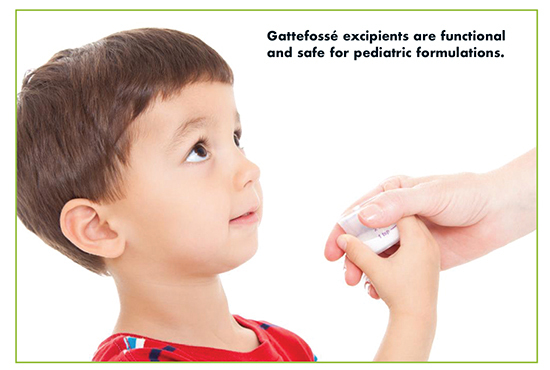 Working within established excipients’ safety and regulatory constraints, Gattefossé is focused on fine tuning and refining currently monographed excipients to develop products with specific functionalities, such as enhancing bioavailability, solubility, permeation, and/or modifying drug release rate for use in different processing techniques. Solubility and bioavailability can be enhanced in SLN/NLC with the multi-functional excipient, Compritol® 888 ATO, explains Mr. Permutt. Defined as atomized glyceryl dibehenate, Compritol may be used up to 3% w/w in direct compression for its superior lubricant properties and at 15-30% w/w as sustained release matrix former. In melt congealing and melt extrusion processes, it is used for modified release. “An important property of this excipient is its superior safety profile and mild taste making it suitable for pediatric dosage forms,” he says. In 2017, Gattefossé launched the Gattefossé Technical Center of Excellence (TCE), which supports customer projects. Services include solubility screening and formulation design and development. In addition, in vitro lipolysis testing is offered to assess the impact of in vivo digestion and its potential effect on the in vivo performance of lipid formulations. “Through the use of these services, customers have reduced the amount of time ordinarily needed to develop workable drug formulations,” says Mr. Permutt. Drug discovery is shifting toward complex and life-threatening diseases, often requiring more sophisticated drug delivery technologies to achieve the therapeutic outcomes. Appropriate selection of excipients and excipient combinations can provide a therapeutic benefit, such as facilitating drug absorption or protecting the active ingredient from degradation. Moreover, it can reduce the overall complexity of a formulation or manufacturing process. For example, two-piece capsules are an excipient that is used for oral and inhalation drug therapy. The capsules provide different functionality based on the shell composition and manufacture. With the development of HPMC capsules manufactured by a thermos-gelation process, drug absorption can be significantly enhanced due to the crystallization inhibiting effect of HPMC in solution.2 “HPMC-based capsules such as Vcaps® Plus, are very inert against low moisture or higher temperatures, which specifically addresses the needs of emerging markets to enable cost-effective and regional manufacturing across the globe,” says Sven Stegemann, PhD, Director of Pharmaceutical Business Development, Lonza Pharma & Biotech. LONZA Pharma & Biotech offers a broad portfolio of HPMC-AS- and HPMC-based mcapsules using the thermos-gelation process. These capsules provide enteric properties without any additional coating or sealing process. This is especially useful for compounds that should be released in the intestine, but which are sensitive to compression. LONZA Pharma & Biotech, pioneered enTRinsic™ drug delivery technology to provide oral delivery with full enteric protection and rapid release (at pH 5.5) in the upper GI tract without the use of coatings. EnTRinsic capsules are manufactured using pharmaceutical grades of cellulosic enteric derivatives. Hassan Benameur, Senior Director, Pharmaceutical Sciences, Lonza Pharma & Biotech says that enTRinsic drug delivery technology is applicable to a range of sensitive molecules including nucleotides, peptides, vaccines, and live biotherapeutic products. Independent analysis estimates time savings afforded by enTRinsic drug delivery technology of 9 months or more through Phase III. 1. Pharmaceutical Excipients Market worth 8.53 Billion USD by 2023, MarketsandMarkets,https://www.marketsandmarkets.com/PressReleases/pharma-excipients.asp. 2. Ouellet et al. Effects of particle size, food, and capsule shell composition on the oral bioavailability of dabrafenib, a BRAF inhibitor, in patients with BRAF mutation-positive tumors. J Pharm Sci. 102(9):3100-3109 (2013).